Puppies! Ultrasound confirms Leia has "at least 6" puppies. Very exciting! ABSOLUTELY exciting! Almost exciting enough for me to book the "I'm coming to get my puppy" ticket! Too bad the ultrasound can't tell us if there is a little guy named Danno in there. Thanks for letting us know Mary! 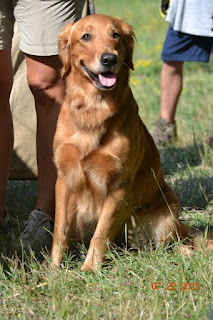 Hi – Will you please post a link to your Blog at The Golden Retriever Community at vorts.com? Our members will love it. Members include: Golden Retriever Owners, Breeders, Rescues and Lovers.